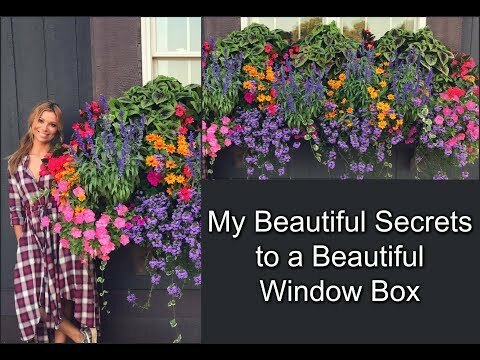 Window boxes are beautiful and maintaining one is something that can lift your spirits. So, how do you do so? Well here are some tips on keeping a window box. To get the best results, be sure that you use a quality potting mix in the box. You can’t really overdo it with quality; it truly is that important. I know from experience that using cheap potting soil is not the right idea. Use a premium soil because it not only holds the moisture, it releases the plant food slowly in the box as well. You will have fewer problems with leggy plants that are dried out. It will also allow you to enjoy your box all throughout the growing season. If you have soil that is left over from last year, just add some new soil and get started. One of the problems that many people experience is that they get too busy to take care of the box. When the weather gets warmer, you will need to water more frequently. That is where rain gel comes in handy and I make sure I use it when I make any type of planter. It allows the soil to hold moisture and reduces how often you have to water the plants. If you put two packets in the box, it should last the entire season. Numerous factors need to be considered when you are planning your window box. One of the factors that are going to make a difference is the size of the box, including the height. You should also consider the positioning as to whether it is in the shade or full sun. I know that in my particular growing zone, it is perfect for growing springtime flowers. They can handle the frost quite nicely until the weather gets warmer. After a few weeks, it is time to begin adding some trailing vinca vine. Not only does this provide a whimsical look for the box, but it is also very hardy as well. If you are not quite sure what to get when shopping, look for some filler, a Spiller and a thriller. The thriller adds heights to the box. The filler will fill in the empty areas of the box quite nicely, and the Spiller is going to empty over the sides and trail downward. If you are limited in space, you may only want to do a filler and a Spiller. Typically, tight boxes don’t allow flowers to grow as tall as they should. If you’re interested then check out these window boxes from Outdoor Art Pros. When you are in a regular routine, you would want to feed your flowers on a regular basis. Typically, you would want to do it every few weeks, and you will notice your plants actually respond to the regular feeding. If you’re more interested in blooms rather than the foliage, choose a fertilizer that is high in phosphorus and potassium. Take a look: Kids Game Room Inspiration - Kids Goes Nuts About! If you are having problems and something doesn’t seem to be working quite as it should, don’t stress about it. You are going to have times when you plant flowers, and they just don’t look as they should. This is normal, and you should not expect everything that grows in the flower box to look as if it belongs on the cover of a magazine. You’re growing them for your own enjoyment, not necessarily to put them together for a photo shoot by a professional. Also, we may be working on a budget so we would need to gather the plants over time, rather than putting them all together right away. It isn’t necessary to spend a fortune and to fill the box all at one time. Although it would be nice to walk into the flower shop and buy as many pristine flats as you need that are full of beautiful flowers, it isn’t something that is practical for most of us. Be sure that you don’t become discouraged. Seasons will change, and then you need to swap out the plants because your flowers will fade. Be prepared for this inevitability. It doesn’t mean that you have failed, some flowers are just not going to do well with the heat. When the days get hotter, the flowers will fade. As long as you are prepared in advance, it gives you the opportunity to try something new.